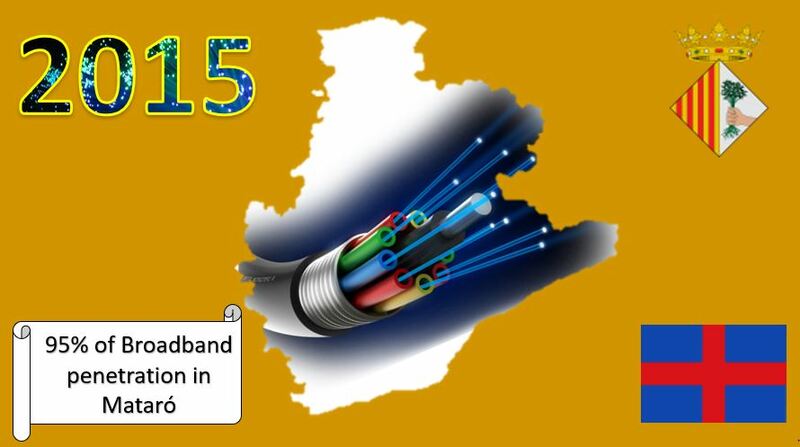 In Catalonia, the technological advances have given us the possibility to enjoy the broadband. Hundreds of cities and towns have access to different types of technology and they also have internet access to upload and download contents. The European Union approved a decree named “as 20/20 strategy” that obligates the country members to install optical fibre before the year 2020. Mataró is the ninth biggest city in Catalonia in regard of the population, which is higher than one hundred twenty-five thousand inhabitants. For this reason, a good connectivity is needed. Broadband technologies will probably be developed in the following years, today we are not able to predict when and where are they going to arrive, but it is evident that the improvements that have been discovered during the last two decades. During the 2000s decade a lot of innovations were introduced in Mataró as long as they were also introduced in other regions of Catalonia and Spain. However, the most important milestone was done at the end of 2014 and beginnings of 2015. 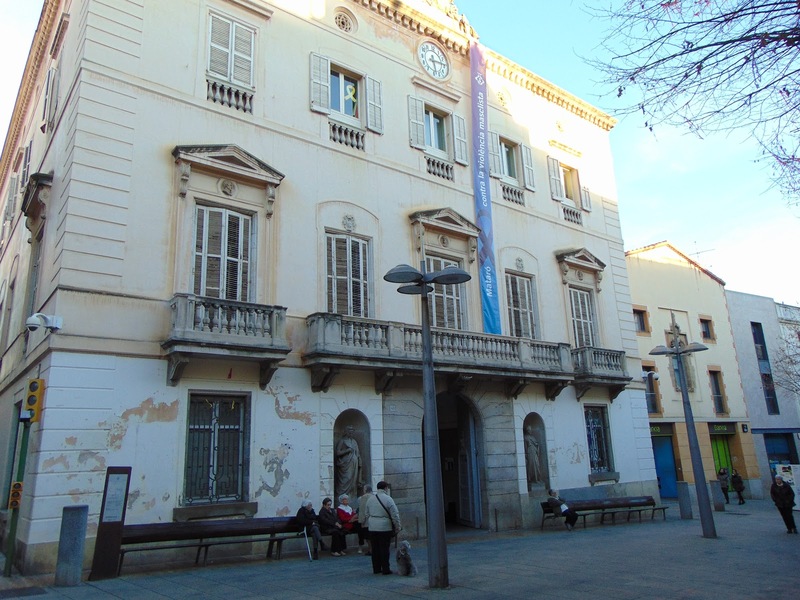 The local government in the last legislature (from 2011 to 2015), led by the mayor Joan Móra, invested a high amount of funds, in comparison with their predecessors, in order to improve the connectivity of the neighbours of the municipality. One of the political aims of the mayor Móra was to offer the possibility for the technological companies to set up in any site of the city. 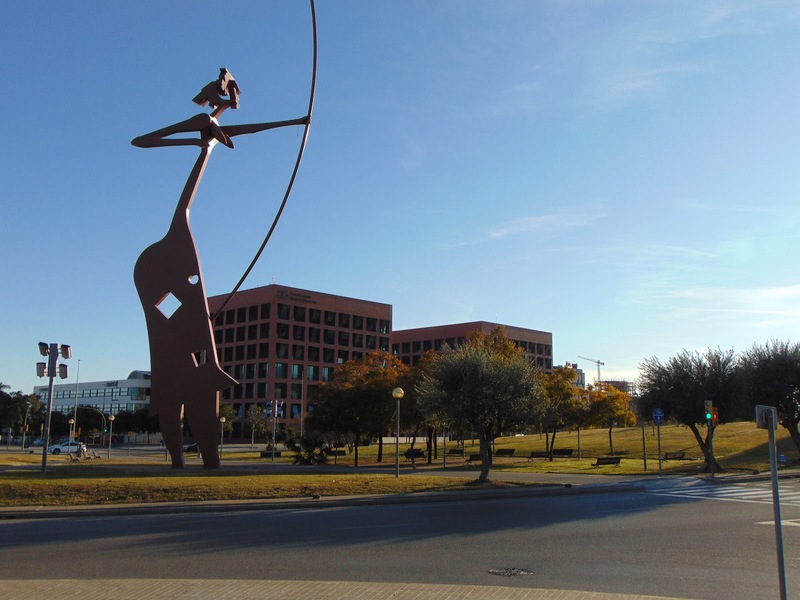 It is for this reason that since 2015, the 95% of the urban area in Mataró is able to enjoy the broadband service due to an agreement between the Mataró city council and XOC (Open Network of Catalonia). This agreement enabled to improve the telecommunications services not only in the city centre but also in the industrial polygons, such as Les Hortes del Camí or Pla d’en Boet, located in the outskirts. This fact is important because industrial polygons had always been dropped out when it was referred to broadband and connectivity and by this agreement, were allowed to optimize their services. 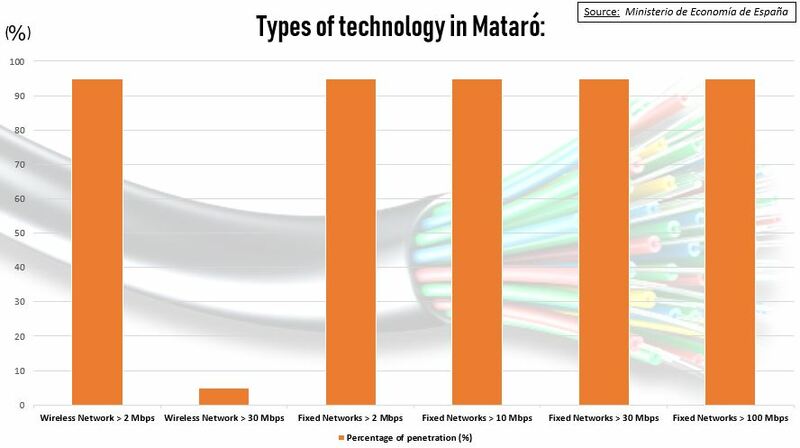 Since 2015, Mataró has a 95% of broadband penetration. Guifi.net, a free and open telecommunications company set up in 2004, was given in 2015 by Bankia some cables to install optical fibre to offer their own service to Mataró citizens as a local operator. 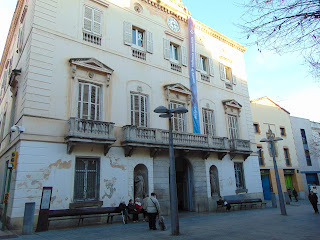 Guifi.net operates in cities all around Catalonia and Comunitat Valenciana and has permanent links in Calldetenes, Gurb, Santa Eugenia de Berga and in Vich. In the case of optical fibre, the company ONO installed cables of that kind in almost all the city between 2010 and 2013. Nowadays, these cables are Vodafone’s property because they bought the Ono enterprise in the year 2014. After them, Movistar and Jazztel did the same and started installing cables of optical fibre in the streets of Mataró. Later that day, the inhabitants of the capital city of El Maresme can contract the FTTH service with more than 100 Mbps. Operators were forced to install optical fibre cables in the streets of this city due to the arrival of the on-line television, which demanded high rates of broadband speed. The different types of technology have a different rate of penetration in the city. While there are technologies like ADSL of 2 or less Mbps or FTTH that have a percentage of penetration of the 95%, VDSL, for its part, only achieves the 5% of penetration. Meanwhile, all kinds of fixed networks, from the one that offers 2 Mbps to the one that offers, 100 Mbps have a percentage higher than the 90%. HFC technology has a penetration of 65% and ADSL of 10 or less Mbps achieves a 75% of penetration. Movistar, Vodafone and Orange are the main companies that supply the broadband technology in Mataró. Another company that may also work in the city is Jazztel, but is less important rather than the other operators because it has fewer consumers. The speed of a broadband connection is a very important factor when choosing an operator and the technology. Speed is crucial for the quality of the service. The demand of high quality connection is one of the main factors that make that DSL technology has been dethroned of the market. Another strong point to consider is the symmetry that means that users have the same speed of uploading and downloading files. Media is one of the sectors that became more benefited by the arrival of optical fibre. There are three local media companies in Mataró, El Tot Mataró, El Capgròs and Mataró Audiovisual. The last one has optical fibre installed and enjoys a better connection in comparison with the other two companies. 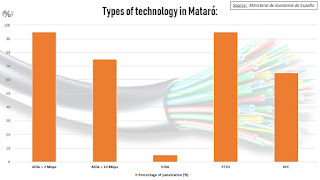 It is due to the fact that Mataró Audiovisual includes a television service and also a radio and internet one, so it needs a good level of speed to cover all their fields. The other two companies are digital magazines and they upload so less content than the biggest local media company. Mataró Audiovisual has contracted the FTTH technology and this lets them reach a broadband speed higher than 100 Mbps. Otherwise, El Tot Mataró and El Capgròs use the technology HFC that enables them to have a good level of broadband speed reaching the 100 mbps. According to a study of the Pew Research Center, the 90% of people consumes local media in order to get information of people, companies and cultural or sports associations of their closest environment. So that, local media need to have a good broadband connection to satisfy the demands of their neighbours, that at the same time, they also are their potential consumers. Furthermore, the same study demonstrates that traditional media, television and radio stations and newspapers, are the most used channels by the local audience, more than the digital newspaper. Broadband penetration allows access to on-line platforms such as YouTube, Twitter, Snapchat and Facebook apart from digital media and other internet services. Job creation is another advantage of having a high quality broadband service, because there are new jobs that have originated from the appearance of YouTube on-line blogs. There are some cases of popular youtubers set in Mataró, an example of them are Widler Soldier and Neus Snow. In view of the above arguments, it must be considered that Mataró is a city with high levels of connectivity, with an important rate of the technology FTTH, which is one of the more advanced. The inhabitants and the local media of the capital city of El Maresme are able to enjoy a powerful broadband access in their homes or workplaces. 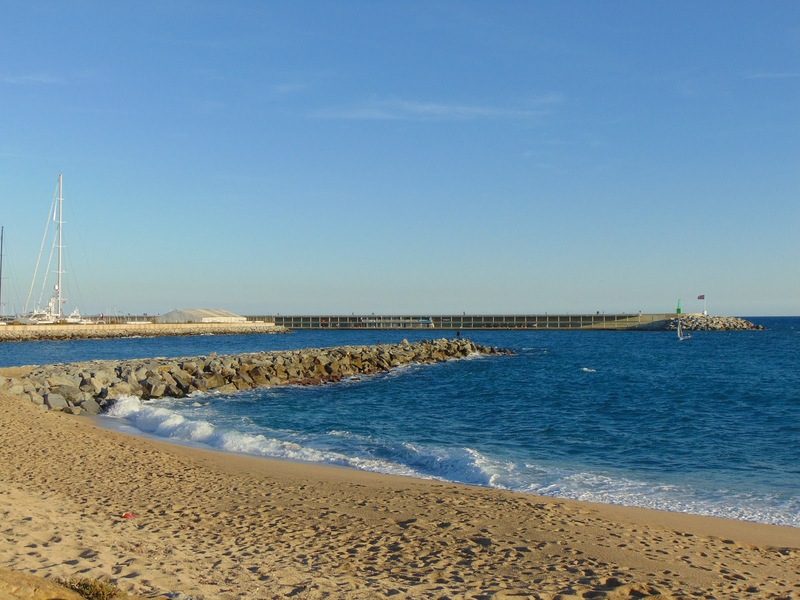 The fact that Mataró is located near the city of Barcelona may help to explain the good levels of connectivity. We analyze broadband evolution (here, the Mataró case) in this blog, in Research Group about Digital Journalism and Marketing and Broadband and in Research Group on Innovative Monetization Systems of Digital Journalism, Marketing and Tourism (SIMPED), from CECABLE, Escola Universitària Mediterrani of UdG, UPF and Blanquerna-URL, in Twitter (@CECABLEresearch), Google+, in the group of LinkedIn, in the page of LinkedIn, in the group of Facebook, in Instagram (CECABLE), in Pinterest and in this blog. We will go in deep in the XXIV Cable and Broadband Catalonia Congress (9-10 April 2019, Barcelona). Os felicito por estos análisis sobre casos locales. Este artículo es muy positivo, ya que nos muestra que es posible que grandes capitales de comarca, como lo es Mataró puedan tener toda la ciudad cubierta con la banda ancha. Todo esto da ventajas a la ciudad, ya que no tendrán ningún problema y es una forma de atraer turismo, a la vez que se ofertan sitios de trabajo, cosa que hace bajar el paro en esta ciudad. It is a really interesting article because it helps us understand everything about the broadband access and the reason behind having such good levels of connectivity living here in Barcelona. Thank you very much for this article! Un gran artículo para dar a conocer el problema que hay con el tema las comunicaciones mediante Internet, en las regiones poco conocidas de Catalunya, sobretodo en los tiempos que corren, que necesitamos tanto esta herramienta que es Internet. Son problemas que en la época que estamos deberían estar más que resueltos. It was very interesting cause most of the people who lives in Mataro will improve their connection. Good article Mr. Fondevila!! Molt interessant l'artícle sobre l'estudi en entorns locals. Gràcies! Very interesting that local connections can establish an improvement in jobs that require a constant connection to the Internet. Such an interesting article which helps understand why it is so important for big cities in our region, specially near the capital Barcelona, to get good connectivity. Congratulations! It's a nice article, Joan! It helps people understand why in the capital city and nearby they have such as good connexion! Useful. Después de haber leído el artículo sobre banda ancha en Mataró, puedo decir que permite mejorar los servicios de telecomunicaciones no solo en el centro de la ciudad sino también en los polígonos industriales, como Les Hortes del Camí o Pla d’en Boet, ubicados en las afueras. No solo mejora las telecomunicaciones de la ciudad, sino que también a favorece en la elección de un operador y la tecnología que ofrece este. También podemos observar que la velocidad es otro factor muy importante para tener en cuenta para la calidad del servicio. La creación de empleos es otra ventaja de tener un servicio de banda ancha de alta calidad. ¡Muchas gracias por tu comentario, Jasdeep! Molt bon anàlisi i molt bon article. Enhorabona pels 50M! Moltes gràcies pel teu comentari, Aura! Molt bon article doctor , es molt interesant el seu análisis, ya que la banda ampla es primordial avui día per poder progresar en el món empresarial. Cada vegada el mercat esta més digitalitzat. Moltes gràcies pel teu comentari, Amanda! Me ha parecido un buen analisis sobre la banda ancha de Mataró, hoy en dia es primordial la connexión a Internet y es importante que todos tengamos accceso y poder conectarmos libremente, todo esto es gracias a las nuevas tecnologías por supuesto. Es un buen artículo ya que hoy en día es muy importante tener una buena conexión a internet porque es necesario para muchos aspectos de la vida, tanto como para trabajar, estudiar o el ocio entre otros. Y las tecnologías que van avanzando facilitan esta conexión. ¡Muchas gracias por tu comentario, Roser! Para una ciudad es importante tener una buena ancha de conectividad, para el desarrollo y mejora. Por eso es importante la importancia de la conectividad no solo en el centro de la ciudad, sino también en los polígonos y a las afueras, así poder tener una buena conexión y facilitar todos los servicios. ¡Muchas gracias por tu comentario, Prince! Muy buen articulo D. Fondevila, nos hace ver la importancia de la conectividad para poder progresar! Un articulo muy interesante D. Fondevila, ahora entiendo el porque tenemos tan buena conexión en Barcelona y en las afueras no tan buena. Y el porque la banda ancha es tan importante en nuestro tiempo. Muestra con un vocabulario fácil de entender la importancia de la banda ancha en las ciudades y como sin ella afecta a la conectividad en las zonas que no son núcleos centrales. Es importante para concienciar a las personas en un futuro. Me parece interante el artículo pues has conseguido que de manera fácil podamos saber cuales son los requerimientos para obtener una banda ancha de calidad con el objetivo de mejorar la conectividad en zonas que no son un núcleo urbano. ¡Muchas gracias por tu comentario, Dayana! Gràcies al article podem veure la importància de que les localitats dispossin d'una banda ample adapatada a totes les necessitats dels habitants i la inclusivitat de totes les zones urbanes en aquesta necessitat per tal de donar un millor servei en les seves tasques. D'aquesta forma também es pot conscienar a altres localitats d'arreu de Catalunya en aquest aspecte perquè prengin les mesures necessàries per oferir aquest servei. Moltes gràcies pel teu comentari, Andrea! Moltes gràcies pel teu comentari, David! Un articulo muy interesante para dar a conocer las buenas noticias sobre la banda ancha en Mataró. Gracias a esto, se permite mejorar los servicios de telecomunicaciones de la ciudad, ya que hoy en día es fundamental tener acceso a Internet. También nos explica otros factores importantes como la velocidad y la calidad.